So I am gonna buy another Miata. Re: So I am gonna buy another Miata. 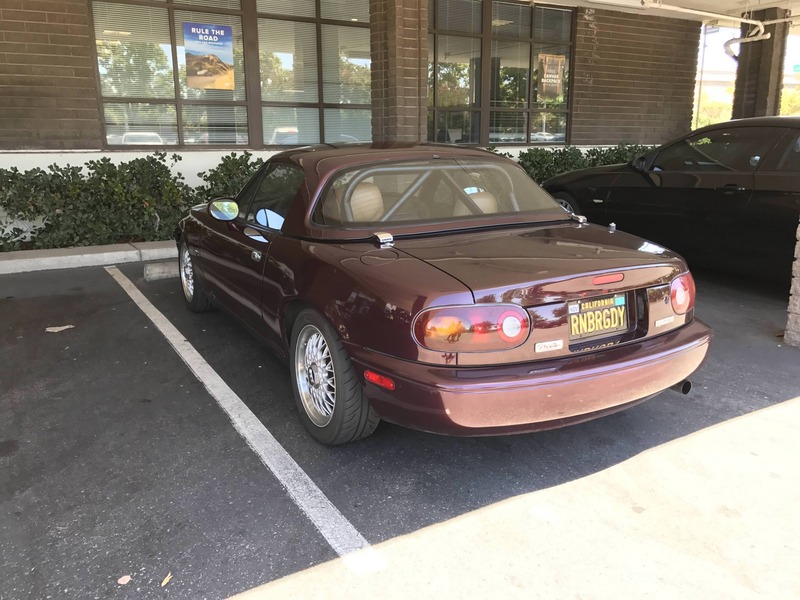 mrFanel wrote: Update 3: So the S/C'd Miata is a definitive no-go. Apparently the reason for it failing readiness codes is due to a cracked head which was discovered after the owner decided to take it a shop. Sadness and despair but at least not my headache. I'd say you dodged a bullet there. "Car I'm selling is just as described in the ad. Except for not passing smog because of the cracked head." maxh2o wrote: Sux about the sc'd NA. sorry man. So I was looking on CL for you just now (I know, you can thank me later), and found this instead. And having owned several MKII's, I'm kind of tempted. Apparently it developed the blinkin-air-bag-o-death. Seller believes its just a module replacement - shouldn't be too bad. How much does it cost, on average, to match the hard top to the body? Update: checked the one above. Mechanically it's sound - dude did a lot of maintenance on it (seals, gaskets, pump, belts, axles, hubs, brakes); drives well, accelerates well to redline, clutch holds really nice which is why he didnt change the rear main but it is barely even weeping... barely any lifter tick. Body is decent; he's lowered on Teins so the front bumper/lip scratch but not too bad. I'd probably get rid of the front garage vary style lip, fix the bumper and go with r-package lips front and back. JR exhaust sounds really nice too. Interior is in good shape but shifter boot seals are shot. Overall - pretty decent car. He wants $5500, will do $5100... I'm teetering; we'll see how I'd feel about it after a good nights' sleep. They always are...and it's an easy 30 minute fix if you're taking your time. 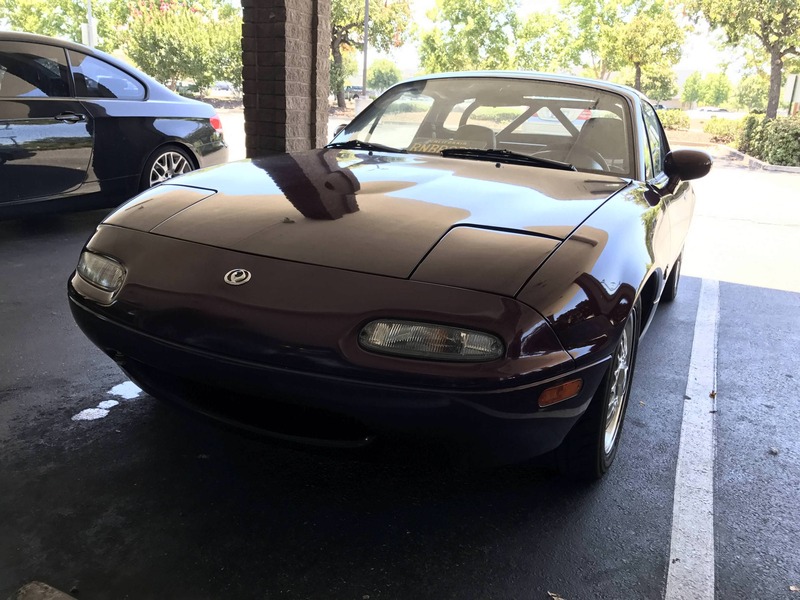 Are Miata front bumper covers made out of fiberglass or all plastic? They might have some glass in them, but you can definitely reform them with heat (like taking out license plate bracket dimples), so that says largely plastic to me. I see. The crack is not significant but probably something I'd fix. Awwww shucks. The dude with the two-tone Miata decided to keep it. Oh well; wasn't meant to be! Hrm - how about this one? If I had the garage space I wouldn't be posting this. Clean looking 91 BRG under 100k! Someone here? If not, someone scoop this up! However - I already have an issue to report. I got the Garage Star hard-top security plates and decided to install them today. 4 out of the 6 bolts that hold the latch no the top itself did not want to come out (22 year old loctite - surprise surprise) so I had to drill and tap... but 3 one of them snapped and is pretty much flush and stuck in the socket. Tried drilling it but the drill bit caught at an angle and I even managed to scuff a bit of the edges (and apparently its fiberglass?) - nothing bad. Gave up since it was the bolt not used by the plate and wet on my merry way. However - it bothers me... and I may not be able to take it out at all. So - if I was to ever put the original latches back on, is it bad to secure it with only 2 out of the 3 bolts? For reference, the bolt that is stuck is the far right one on the right latch when inside the car. mrFanel wrote: 4 out of the 6 bolts that hold the latch no the top itself did not want to come out (22 year old loctite - surprise surprise) so I had to drill and tap... but 3 one of them snapped and is pretty much flush and stuck in the socket. You need to use heat to break the bond of the loctite - big soldering gun, torch with a really fine tip, something like that. Not surprising. You'd need to use a center punch first, then start with a fairly small bit and work your way up in size. I would be inclined to heat first, then use left hand drill bits to see if the screw backs out on its own. If you'd rather not acquire left hand bits, I'd probably punch and drill a couple sizes, then heat, then stuff a screwdriver or something into the hole (ez-outs are actually the correct tool here) and try to back it out. I can't imagine Mazda would have used three fasteners if they didn't think it was necessary. Regardless of necessity, the hole is there and it would bother me to no end. I think you'll be able to get it out once you get some heat on it. The bolt ain't coming out. I took it to a shop I trust and their assessment is that without drilling through the bolt AND likely drilling through the fiberglass, the bolt aint coming out. It's took dangerous of a job - though they think it is possible to replace the riveted potted plate - but that too is not very easy to do. So - final consensus is to leave it be, use the Garage Star security plates (which do not use that bolt) and when I take the top off, I'll clean the threads with a tap and get a new set of security bolts.